There’s an increase in outdoor blogs, it seems I find weekly new, interesting blogs, and thus I thought to set out and share some unsolicited advice on how to write an outdoor blog, which also might be appreciated by those who are thinking about starting one. This obviously will represent my open and free approach to blogging about my passion, and thus shall be known as a subjective treatise on “The Art Of Outdoor Blogging”. 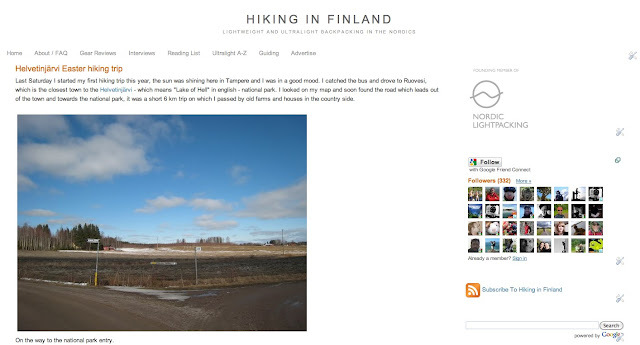 <a href=”http://www.hikinginfinland.com/2009/04/helvetinjarvi-easter-hiking-trip.html”target=”_blank”>My first trip report</a> from back in the day. If you start a blog, and after you have thought about a name, you will need to decide where to open your blog. I’m on <a href=”http://www.blogger.com”target=”_blank”>Blogger</a> for the simple reason that I prefer the draft editor to the one on <a href=”http://wordpress.com/”target=”_blank”>Wordpress</a>. As I spent the most time writng, an easy to use draft editor is important to me, and Blogger has a lot of new, interesting things coming. Wordpress does a kickass job, though, and has many things which I’d like as well. In the end it is a matter of taste and preferences, and what friends and acquaintances might recommend you. I recommend Blogger. Pro Tip: Make sure to use <a href=”http://draft.blogger.com/”target=”_blank”>draft.blogger.com</a> as your dashboard, as it allows you to access all those very useful features like mobile optimization and Template Designer. If this is just a pastime, go for the free option. It saves you HTML5, CSS3, and a whole other bunch of troubles to learn and understand if you host yourself. It also, ähem, doesn’t cost you anything. Self hosting means you will at least spend for a web hotel and the domain name, and possibly for some other technology which you might need if it doesn’t come standard. Downsides to free hosting: On Wordpress you might get Ads on your blog, and Google might control even more of your life. If you’re a scared person, then self-hosting is the way to go. Pro Tip: Support your local web hotel provider, and if possible get one which cares about the environment. Data centres are energy hungry monsters which consume vast amounts of electricity. You want to hike in the outdoors, make sure your web hotel provider thinks about that too. Get it. 12$ on Blogger, 13$ on Wordpress. It is easier for your readers to remember you, and 12$ are a dollar a month so it ain’t a big investment, though it will increase your readers and “brand awareness”. Just think about it, if you tell the guys at the campsite that you’re writing a blog, it is easier for them to remember it if it is a short name without a “.blogspot.com” after it. Getting the blog to run on the new domain is also super simple on Blogger and Wordpress, with lovely instructions for all us non-geeks. Easy answer: As much as you like. Better answer: Two to three max. I’m not reading blogs which update daily (don’t have the time), not to mention those which update multiple times per day. It is annoying. The quality isn’t there. It often feels like there is just a post for the sake of posting something, even if you got nothing to say. If you have a lot of stuff to share, join <a href=”http://www.twitter.com”target=”_blank”>Twitter</a> (Yes, you definitely should join Twitter, at least to share your new articles!) or get a <a href=”http://www.tumblr.com/”target=”_blank”>Tumblr</a>/ <a href=”https://posterous.com/”target=”_blank”>Posterous</a> account and go ahead. For me, and for many others, blogs are about quality posts which are well written, accompanied by good photos. The chances that one can produce that on a daily basis are very low. Quality over quantity, that should be your motto. I strongly believe in accompanying blog posts with beautiful, well composed photos. I also know that I am not alone with that thought. They loosen up the story and help to illustrate your trip, experience, idea, or a piece of gear. A good photo for me is at least sharp, has a decent resolution and size (I’m rarely interested in clicking photos to enlarge them, so please spare me thumbnail-sized photos). <a href=”http://mcalisterium.wordpress.com/”target=”_blank”>Fraser</a>, <a href=”http://www.petesy.co.uk/”target=”_blank”>Peter</a>, <a href=”http://i-cjw.com/”target=”_blank”>Chris</a> and <a href=”http://thunderinthenight.blogspot.com/”target=”_blank”>Joe</a> all make good photos - be inspired by them. And if you’re really motivated, <a href=”http://vimeo.com/hendrikmorkel/”target=”_blank”>try video</a>. <a href=”http://picasa.google.com/”target=”_blank”>Picasa</a> or <a href=”http://www.flickr.com/”target=”_blank”>Flickr</a> are the best for hosting and integrating your photos in your articles; I use both and don’t yet have a favourite. A good picture says more than a thousand words. Pro Tip</i>: Get a Sony NEX-5 or Panasonic Lumix GF2 . They’re both excellent cameras which make splendid photos. A much discussed topic in the outdoor blogsphere. I find comment moderation the worst thing if you want to get comments, foster communication and create a community. Nothing is more annoying than to read “Your comment is awaiting moderation” after you made the effort to write something. I am no longer commenting on blogs which have comment moderation, period. I know the arguments and dismiss them. Spam filters are excellent, Spammers on outdoor blogs few, and if the odd spam/ nasty comment comes through, you always can delete it. What you lose by enabling comment moderation is comments and easy interaction with your readers. As you can see, there’s a bunch of different screen resolutions to be found among my readers, and that’s only people accessing Hiking in Finland from their computers. But the important bit here are the well over 600 visits (and growing) each month from mobile devices, and especially the iPad is very strong there, with over 350 visits. The rest is from iPhones, BlackBerries, Android phones and even Nokia phones ;) It is fairly easy to enable the mobile view for your blog when your on Blogger and Wordpress, and it doesn’t affect your normal site at all - but it makes your site, when viewed on a Smartphone, a joy to navigate and read! Pro Tip: If you’re a geek, get your blog running on <a href=”http://lessframework.com/”target=”_blank”>Less Framework</a>. ‘nuff said! Stats don’t matter - but are nice! <a href=”http://www.google.com/analytics/”target=”_blank”>Google Analytics</a> and <a href=”http://haveamint.com/”target=”_blank”>Mint</a> are a nice and easy to use tools to see where your readers are coming from, what they are reading, how long they stay, which resolution and OS they have, and a lot more stuff. Google Analytics is free, Mint costs $30. I use the former. Blogger and Wordpress both have some quite decent analytics tools, but if you want more information, then you should try one of the above. Flattr is thus a bit like a PayPal donation, just easier and more private. It shows that you value the time and dedication the writer has put into his article and blog, and it shows the writer that his articles are liked and he is motivated to write more. Its flattering! I urge you, if you have a blog or are going to start one, to install Flattr. It is a nice way to show you liked the free content someone created. Pro Tip: <a href=”http://blog.zottel.net/2010/09/flattr-plugin-for-bloggercomblogspotcom.html”target=”_blank”>How to install a Flattr plugin for each new blog post</a>, automatically, on Blogger. It looks more difficult than it is. As I was able to do it, so will you! A simple RSS tool for your blog is <a href=”http://feedburner.google.com/”target=”_blank”>Feedburner</a> by Google. The beauty of it is that it allows your readers to choose their RSS reader of choice to read your blog. I find it superior to the Wordpress/ Blogger RSS tools, though it is not as accurate as Google Reader in giving you the exact amount of subscribers (in case that matters ;). Pro Tip: <a href=”http://www.eblogtemplates.com/how-to-setup-feedburner-on-blogger/”target=”_blank”>How to setup FeedBurner on Blogger</a>. Feedburner allows your readers to use a multitude of RSS readers to read your blog. I came up with the <a href=”http://www.hikinginfinland.com/search/label/The%20Week%20In%20Review”target=”_blank”>The Week In Review</a> simply because I wanted to share great articles which I have found, and drive traffic to some worthy articles and blogs which otherwise might be overlooked. I do this occasionally on Twitter, though as not everyone who reads here is on Twitter creating a once a week post which highlights the best seemed like a good idea - and judging from all the great feedback from you ladies and gentlemen, I was right. I’d encourage you to link and spread the word about blogs and articles you have enjoyed in your posts. This might take the form of a mention and link in a post, a ReTweet on Twitter, a Like on Facebook, a Stumble Upon or just telling your hiking buddy in the bar about that thought provoking post you read and he should have a look at. Pro Tip: Sharing is Caring!